Micro Max is a “Next Generation” turf product designed to be a stand-alone micronutrient package, or compliment 8% Iron Chelate. This product allows you to target a desired Iron to Manganese ratio based on various site specifics such as type of turf grass and/or time of year. Rich in organic acids and plant beneficial compounds, this product is effective on all types of turfgrass during any condition. 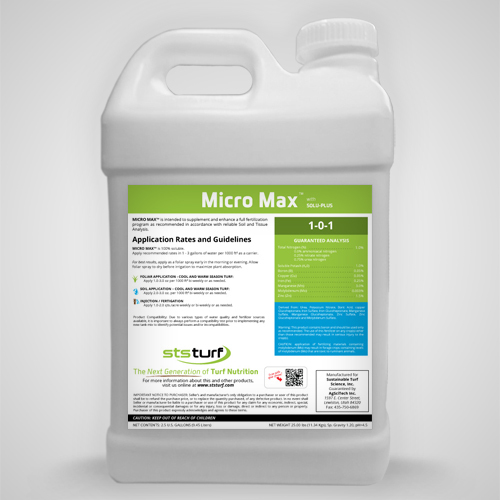 Micro Max offers the highest quality micronutrient sources, organically chelated, using plant beneficial pre-digested compounds that can be easily metabolized to facilitate efficient absorption, and maximize turf health response. Whether it is chlorophyll or carbohydrate production, cell wall integrity or enzymatic responses, Micro Max ensures you have no limiting factors when it comes to micronutrients. The addition of Solu-Plus in this product, works to maintain nutrient availability, enhance turf absorption, and/or root uptake. Multiple vitamins, enzymes and organic acids compliment the micronutrient package. To deliver all the essential micronutrients in balance, combine Micro Max and 8% Iron Chelate.